Total revenue for the nine months grew by 2% amounting to $12.26 billion, up from $11.98 billion reported a year ago. For the three months ended September 2017 the company saw a 14% increase in revenue closing at $4.18 billion relative to the $3.70 billion in 2016. According to the company “This was attributable to increase in volumes distributed to the domestic market”. Depreciation and amortization closed at $400.23 million (2016: $359.03 million). 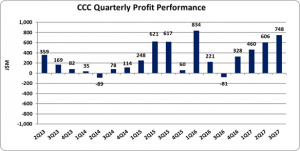 CCC reported Stock Holder and inventory restructuring gain of $30.42 million compared to a cost of $406.45 million in 2016. CCC also reported zero Manpower Restructuring Cost in 2017 compared to $407.25 million in 2016. Interest Income amounted to $1.92 million for the period compared to $1.60 million for the corresponding period in 2016 a 20% increase. Furthermore, the company reported a $4.40 million Finance Credit compared to a $37.86 million Finance Cost reported in 2016. Profit before taxation totaled $2.07 billion, this compares with profit of $1.26 billion recorded last year. Net profit for the year closed at $1.81 billion relative to net profit of $973.36 million during the corresponding period in 2016, an increase of 86%. For the quarter the company reported Net Profit of $747.88 million relative to a net loss of $81.12 million. Consequently, earnings per share (EPS) amounted to $2.13 (2016: $1.14), while the EPS for the quarter was $0.88 (2016: Loss per share of $0.10). The twelve months trailing EPS is $2.52. The number of shares used in this calculation was 851,136,591 shares. Total Assets grew by $1.72 billion or 16% to close at $12.36 billion as at September 30, 2017 (2016: $10.63 billion). The increase in total assets was largely due to the increase in non-current assets which grew by $1.83 billion to a total of $7.87 billion (2016: $6.03 billion). Shareholder’s equity totaled $9.62 billion compared to the $7.41 billion quoted as at September 30, 2016. This resulted in a book value of $11.31 (2016: $8.71). The number of shares used in our calculations amounted to 851,136,591 units.